What to look for when buying a used Honda Pilot? 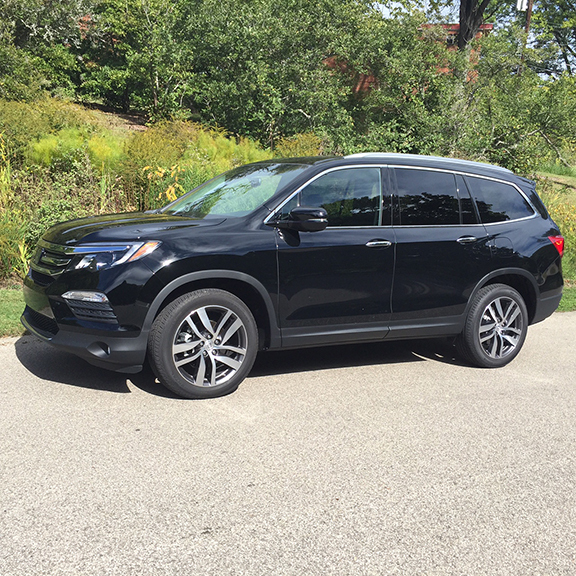 The Pilot was introduced in 2003 to the North American market and is the largest crossover sport utility vehicle in Honda's lineup. With three rows of seating and a reputation for all-weather handling, the Honda Pilot has become one of the automaker's best selling vehicles. The Pilot's platform is shared with several other large Honda-made vehicles such as the Acura MDX, Odyssey, and Accord. All of these vehicles are built in Honda's facility in Alabama for the North American market. The Pilot has now grown to be sold in several global markets under various names. The Honda Pilot is often seen on the used car aftermarket as a good option for SUV buyers. With high mileage potential if properly maintained, the Pilot enjoys Honda's overall reputation for longevity and durability. There are three generations of the Pilot, beginning with the 2003 model year. The second-generation was introduced in 2009 and the third generation in 2016. Most have both front-wheel and all-wheel drive options and all are powered by a V6 engine. As with all used vehicles, the older the Pilot being considered for purchase, the more attention should be given to the chassis and underbody for rust, corrosion, and wear and tear. First-generation Pilots are now over a decade old and are likely to begin showing wear in suspension, chassis, and steering components. Especially if relatively hard use (towing, off-pavement driving) have been common for the vehicle. Of particular note in the Honda Pilot, especially the first and early second-generation vehicles, are braking components. They are prone to fade over time and have had occasional failures. Some owners report transmission failures with age as well, likely due to lack of maintenance with fluid changes. Many second-generation Pilots were part of the overall Honda recall for airbags from the Takata scandal. As with any used vehicle, the VIN number should be checked with a dealership to verify that all recalls have been resolved. On the whole, the Honda Pilot is an excellent used vehicle choice. Finding a quality, used Pilot is not difficult if time and care are given to locate the right vehicle. What Honda Pilot model year and mileage can you get for your budget? When reviewing vehicles, it's important to stay unbiased. However, for this vehicle, my wife was ultra excited. We own a 2013 Honda Pilot, and it serves our family well. We tow our camper with it, and it's the right vehicle for her as a daily driver, and weekend warrior. So when she heard I was getting the 2016 Pilot to review, she was giddy. She had already been contemplating upgrading to the new model and this would be a good opportunity to spend quality time with it. For 2016, the Pilot is completely redesigned with new looks, a new powertrain and redesigned interior. Year after year it is becoming clearer that Honda Quality doesn't mean what it once did. The 2013 Honda Pilot is a lesson in mediocrity in most areas but continues to be a trendsetter in the world of utility and convenience. After debuting in the 2003 model year, the Honda Pilot is still only in its second generation of production; Honda may want to consider a refresh in the near future if they want to boost sales for the midsize SUV. The 2013 Honda Pilot doesn't offer much in the way of change from previous models. The only real differences can be noted in the electronics; hands-free Bluetooth linkup and a rearview camera now come standard. What it does offer is one of the largest and most family-friendly interiors of its class. If you can get past its substandard driving capabilities you should find a very capable midsize SUV.